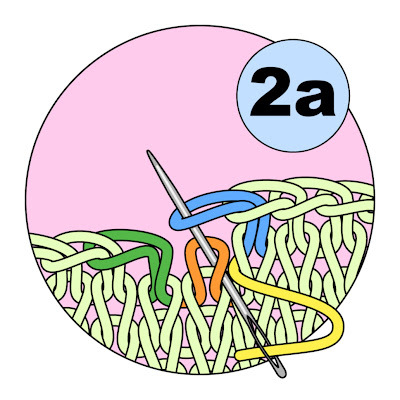 The gappy default is to simply chain bind off all the way around, and then to end the bind-off by pulling the tail yarn (yellow) through the last stitch (blue). 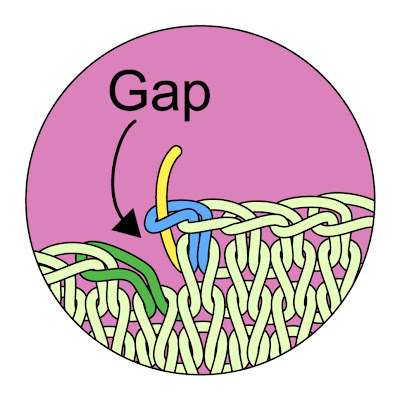 In this default method, the knitter simply accepts the gap between the first stitch bound off (green) and the last stitch bound off (blue) as shown on the illustration below. 1a: After binding off the last stitch (blue) thread the tail (yellow) onto a blunt tipped, large-eyed sewing needle ("tapesty needle"). Insert the tapestry needle up into the blue stitch from underneath, as if you were pulling the final tail through the last stitch in ordinary chain bind off per the default method. Next, insert the needle from the back to the front, under BOTH arms of the first stitch bound off (green). 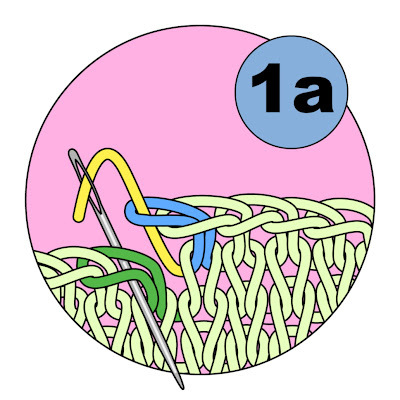 Illustration 1a shows the tail (yellow) worked through the last stitch bound off (blue), and the needle inserted under the two arms of the first stitch bound off (green). 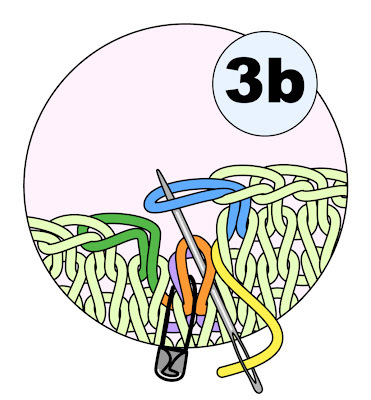 1b: Th needle, which has been drawn through the green stitch to the front, is then re-inserted into the top of the blue stitch, inserting from the top, downwards, as shown. 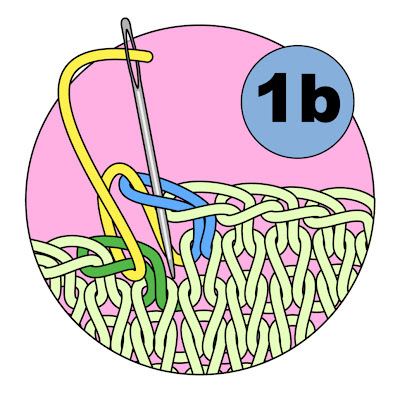 1c: This method creates a bridging stitch (yellow) between the last stitch bound off (the blue) and the first stitch bound off (green). As you can see, the bridging stitch actually acts as an additional chain bind-off stitch inserted into the top of the bind off. Truthfully, in thin yarn, this extra stitch (yellow) is unlikely to ever be noticed, but in bulky yarn, that extra (yellow) stitch may cause an awkward bump. 2a: To work method 2, the first step is to thread the tail (yellow) onto a tapestry needle. The needle is then inserted purlwise into the last remaining live fabric stitch (orange) as shown in illustration 2a, and next inserted up into the last stitch bound off (blue) from underneath. 2b: The needle is drawn through the top of the last stitch bound off (blue) and next inserted from the back to the front, under BOTH arms of the first stitch bound off (green). 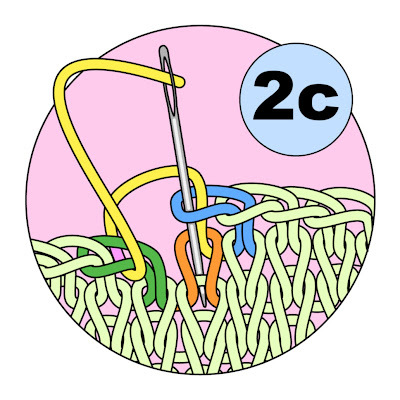 2c: The needle, which has been drawn through the green stitch to the front, is then re-inserted into the top of the blue stitch, working from the top downwards, and then inserted knitwise into the top of the orange stitch, as shown below. 2d: As you can see, the result of method 2 is really pretty good. The (yellow) bridging stitch which you have created with the tail yarn is not an extra stitch as it was in method 1: although the yellow stitch was worked with a sewing needle, it is actually a knitted chain bind-off stitch worked into the top of the final live fabric stitch (orange). In fact, this little trick of making knit stitches with a sewing needle is the same idea as the Kitchener stitch (also called grafting). In other words, method 2 grafts the top of the last stitch bound off (blue) to the top of the first stitch bound off (green), while also binding off the last live fabric stitch (orange) all this while following the same path which the other knitted bind-off chains have followed. Now circular knitting, as you know, is not actually done in circles. Rather, circular knitting is done in an endless spiral, where each round has no true beginning or end. This means that any method which simply binds the last stitch to the first will create a jog where the level changes. Specifically, the last stitch bound off (blue) is actually one row higher than the first stitch bound off (green) and so there is a little jog where the levels are drawn together: the green stitch is humped up slightly, while the blue stitch is drawn down. 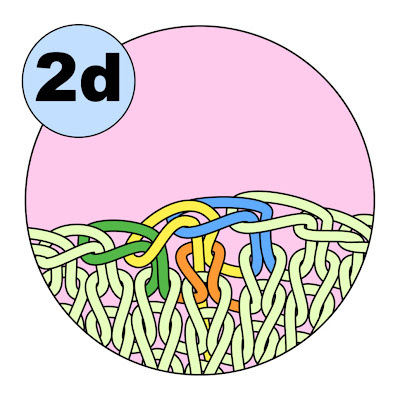 For sheer perfection, it is possible to modify method 2 by adding one more refinement to the top of a circular bind off, and this last refinement (method 3) does away with this level change--it eliminates that jog. Normally, the jog of the level change in spiral knitting is smoothed over by simply sliding the first stitch of the round from one needle to the next, thus forcing it to span two rows. (This is the trick behind eliminating the jog in jogless stripes). However, simply slipping a stitch at the top of the work would result in the bar behind the slipped stitch perhaps showing on a rolled edging (as you know, a rolled edging exposes the purled side of a stockinette fabric, so that the bar behind the stitch slipped across would show). 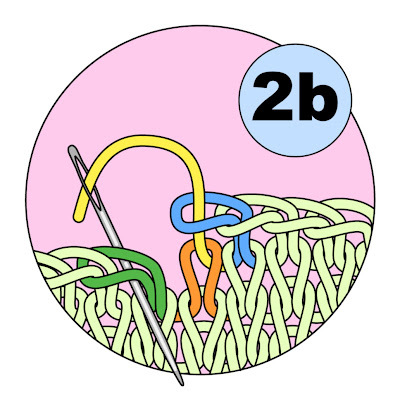 3b: The bind-off proceeds around the garment, and comes back to where it began, stopping when the stitches on the holder are reached. The tail (yellow) is threaded onto a tapestry needle, and inserted purlwise into BOTH stitches on the holder, the orange and the purple. This step ends when the needle is inserted up into the last stitch bound off (blue) working from underneath, upwards, as shown. 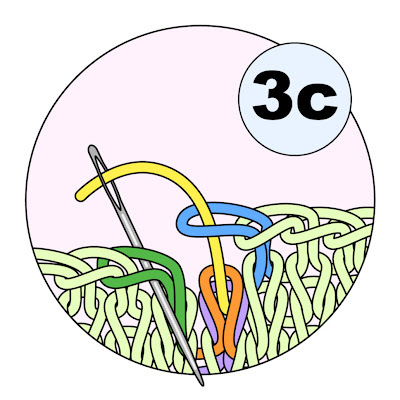 3c: The needle is drawn out through the top of the blue stitch, and next inserted from the back to the front under BOTH arms of first stitch bound off (green). 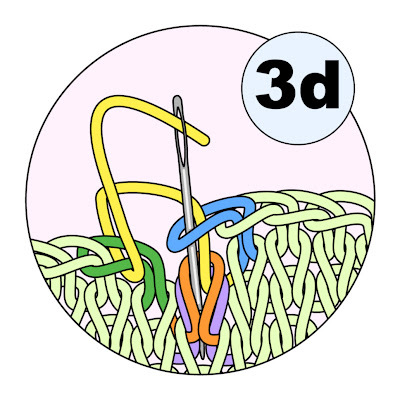 3d: The needle, which has been drawn through the green stitch to the front, is re-inserted into the last blue stitch, working from the top, downwards, as shown. The needle is then inserted knitwise into the orange and purple stitches, as shown. 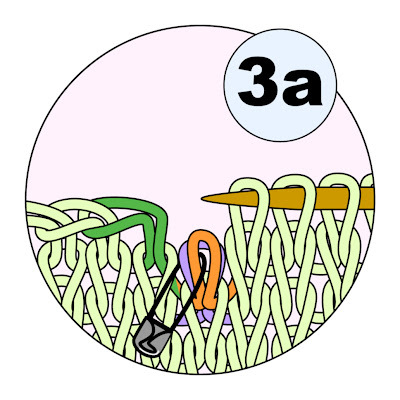 3e: As you can see, knitting the orange stitch into the purple stitch helps eliminate the jog. Leaving a moderate amount of slack in the orange stitch back in step 3a means that this orange stitch has enough play to stetch across the change of level. Also, because this orange stitch was knitted into the purple stitch below it rather than bing slipped, there is no slipped yarn acorss its back to show on the purl side of a rolled edging. 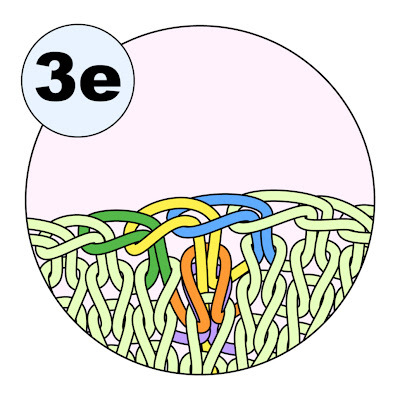 As in method 2, the green and blue stitches are connected by the yellow bridging stitch, which also binds off the remaining live stitches (orange and purple). As to which method to use, the choice is obviously yours. My own usage is as follows: On a toe-up sock top, method 1 (the OK method) is fine--the yarn of a sock is so thin that the extra chain stitch squeezed in will never show. Plus, trying to work method 2 or method 3 means working a sewing needle in the correct sequence through very small stitches indeed--a job which would certainly require me to get up out of my chair and hunt out a pair of magnifying glasses. On a bulky hat brim, method 2 is the method I would use: The slight jog would look better to my eyes than the doubled bulk of method 3. However, on the bound off edge of a garment knit circularly in the range of 5 st/in to about 6.5 st/inch, I would certainly choose Method 3, the excellent method, especially if the garment has a rolled edge. Done correctly, method 3 simply will not show--it is even hard to find if you go hunting for it with your glasses on. Of course, there is always a rascal in paradise, and so it is here. With all three of these methods, the tail remains loose and has to be worked in. For this, I personally would pull off the tapestry needle, re-thread the tail yarn onto a nice sharp needle, and skim in the end. For a rolled edge, I'd skim on the stockinette (front) face of the fabric, just in the first row down, where the skimming would be hidden by the roll of the fabric. You have been reading TECHknitting on: Casting off circular knits.